While our Singaporean friends were in town a week ago, I went with a couple of them to Yaowarat, Bangkok’s Chinatown, for a nighttime seafood dinner. The streets are no less busy once the sun sets as impromptu restaurants – movable feasts, really – open up on the sidewalks. Seafood is the specialty of the neighborhood, with several well-known sidewalk vendors offering the freshest seafood available in town. A dozen river prawns, simply grilled. The flesh was sweet, the only thing needed was some spicy homemade sauce of chilies, fish sauce, and lime juice. 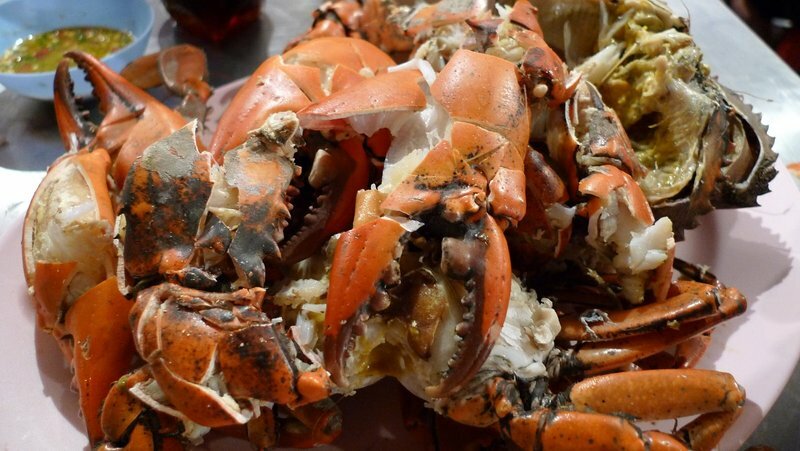 A plate full of crabs, steamed and cracked for our easy eating. The prawns, crab, and a plate of fried rice were all the three of us needed for a tasty and surprisingly affordable dinner. 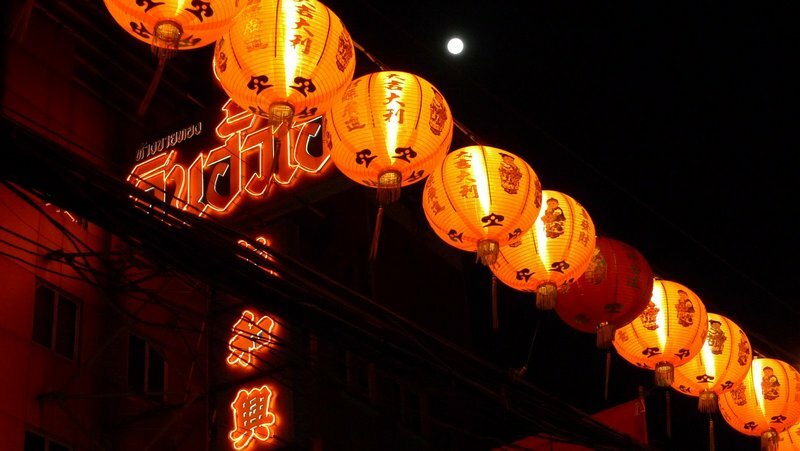 As we finished dinner and headed back to the friends’ hotel, I noticed the moon, just a day or two past full, lost amidst the bright lanterns of Yaowarat. This entry was posted in Uncategorized and tagged Bagnkok, food, Seafood, Yaowarat by christao408. Bookmark the permalink. Nice sumptuous shrimps and crab dinner. I remember there are scores of bird nest soup and sharks fin soup eateries too! I love the picture of the lost moon! The crabs look inviting. I do love seafood! Yum! I like the lanterns. They bring me some memories. OMG WANT! I love fresh seafood but totally agree with you about the lime and chilies and fish sauce concoction. nom nom me want some!!! yum! i haven’t had seafood in a while… this post is making me crave it. Ah, the last night we were in Bangkok we stayed in Chinatown, on Yaowarat, at the Chinatown Hotel. Had seafood too, at a place across the street from the hotel. Unfortunately, there was a plume of diesel smoke that hung about 5 meters in the air that burned our eyes. We didn’t feel much like walking around, I thought we could walk to the rail station, but couldn’t quite make it on the test run. We ended up taking a taxi to the airport.The Chinatown Hotel must have been a grand old place 70 or 80 years ago. I’m drooling. Crab, prawns, rice… and to think I made French Toast for dinner. Sure everyone ate and smacked their lips but it wasn’t seafood… I know what I’m having Wed. night! I went to Chinatown to have seafood a few years ago. Can’t remember the name of the place but I remember sitting by the roadside. Absolutely delicious though. OMG – I had leftovers tonight. The food looks fantastic. You’ll have to excuse the drool drippings all over your blog. (I call it lip juice). @CurryPuffy – Yeah, birds’ nest and shark fins are in abundant supply there. The shark fins are something I’m avoiding anymore. Seems a cruel practice that the rest of the shark is usually just thrown overboard to drown. Kind of wasteful. @Fatcat723 – Glad you liked that picture. I was a little surprised it turned out so well, given that it was a hand-held shot. @foggysunnymorning – I bet they do. Lunar new year is such a great time to go down there since the usual symphony of neon is decorated even more brightly! @fuzzynavel – It doesn’t take much more than that sauce to bring out the best in fresh seafood, does it? @nov_way – A meal with friends is always pleasant. Good food just amplifies the pleasantness! @Ricardo98 – I’m curious about the hotel’s history. 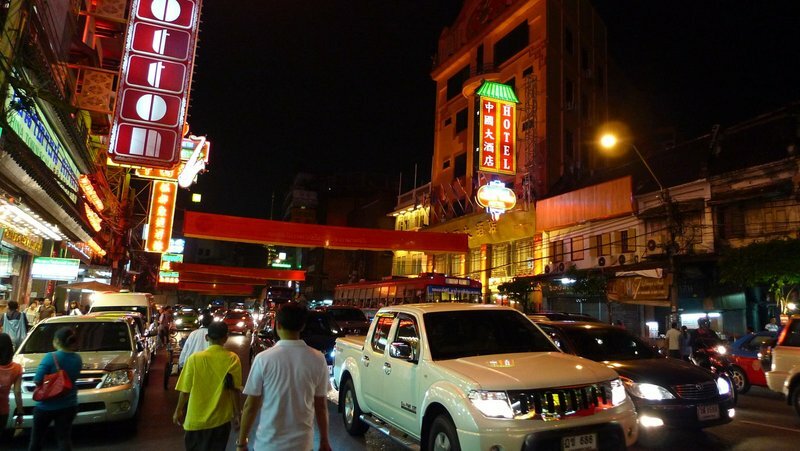 There are many places like that in Bangkok, hotels that were probably once grande dames of the social scene and are now catering to tour groups from developing countries. As for the haze of fumes while eating, that’s definitely a risk of eating on the street, especially in Chinatown. Thankfully, we’ve had relatively cool and breezy weather in the evenings, which helps a bit. @chosen4evr – Oh, you should most definitely add Thailand to your to-visit list. Fantastic country and well worth the trip. @murisopsis – French Toast sounds good… =P@icepearlz – In Chinatown BKK there are basically two main outdoor seafood places sitting on opposite corners. No doubt it was one or the other of them! @ElusiveWords – I’ll ask you to keep that lip juice off my blog, thank you. @RushmoreJ – @icapillas – @ItsWhatEyeKnow – @yang1815 – Glad you enjoyed it! Thank you! 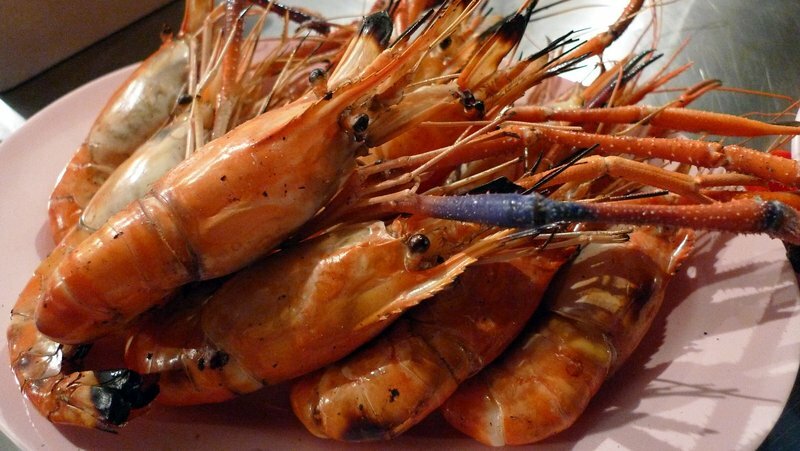 the prawns looks wonderful … I wonder if they are as sweet as BC spot prawns? @AppsScraps – I wonder, too. Haven’t had BC prawns anytime in the past half-decade so wouldn’t trust my tastebuds’ memories. But these prawns here were mighty nice.